Home » cancer , christianity , franincense , history , jesus christ , medicine , science » Is a gift of the Magi a cure for cancer? Is a gift of the Magi a cure for cancer? Frankincense, the precious fragrance that was among the gifts that the wise men from the East brought to the infant Jesus, is now being studied intensely for its cancer-fighting properties. There's something in frankincense that compels cancerous cells to "reject" nuclei and reset back to what the normal governing gene sequence should be. whoa! we JUST talked about this in my art history class! 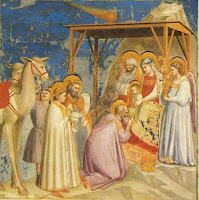 its by giotto di bondone, i think its called adoration of the magi. what's cool about it is that the star of bethlehem is actually halley's comet. Yup, you got it. And that's the reason why the European Space Agency's probe to Halley's Comet in 1986 was named the Giotto mission (which gave us the first images ever of a comet's nucleus).